BlueRock Energy Services opened business in November 2012. We have a team of dedicated and experienced industry professionals who are trained to the highest standards to deliver safe and reliable services to our clients. "Blue Rock Energy Services Inc. is a team of highly motivated and committed individuals striving to surpass our customer's expectations. We are committed to evolving with ever changing industry standards with a positive and cooperative approach to excellence in service." By combining employee safety and well maintained equipment we are able to remain focused on delivering the most affordable, safe and reliable service on the market. 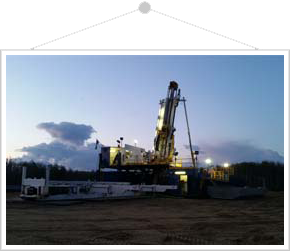 Through our dedication to superior service and performance we will exceed your expectations and redefine what a drilling contractor should be. Our growing list of rigs is also an affirmation that our clients are happy with our work and committed to working with us long term. © BlueRock Energy Services All Right Reserved.